Early Sunday morning, we got word that Nanna’s Frozen Berries were pulled off Australian store shelves. Why? Because it was reported that these frozen mixed berries were possibly contaminated with hepatitis A.
Victorian company, Patties Foods, released this statement on Sunday. After sourcing their frozen berries from countries like China and Chile, the company located at Bairnsdale were notified of four adult victims of hepatitis A, three in Victoria and one in New South Wales. Hepatitis A is caused by traces of faecal matter containing the virus contaminate hands, objects, water or food. It is an uncommon disease around this country and if it found, there is normally a strong link between consumption of the product infected by the virus. Symptoms of hepatitis A include fever, loss of appetite and nausea, and can progress to jaundice, which is dark urine, yellowing of the eyes. The voluntary recall was made in the best interest of their customers and for them, the most important thing is the well-being of their consumers. 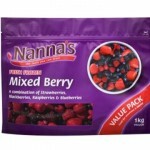 Since the berries have a two-year shelf life, if your Nanna’s frozen mixed berries were purchased from October 2014 onwards should be thrown out.